This is my first Christmas to be spent in Ukraine and certainly many things are very different here. First of all, the Christmas season really does not begin until January 1st so very few have decorations or trees up yet. We do! Katya has done an excellent job of decorating our home like an American Christmas! It’s beautiful! Second, Christmas here is much simpler than in the US. Usually, everyone gets just one small gift for Christmas. Katya and I had purchased a few gifts and put them under our little tree. One Ukrainian friend was visiting and was amazed at ALL the presents under the tree! Katya said she could not bring herself to tell about all the presents we have in America under our tree! Needless to say, Christmas in Ukraine is much simpler (as maybe it should be). Finally, Christmas is not really until January 6/7 (St. Nicholas Day) because we live in an Orthodox country. But many believers still celebrate Christmas on December 25th like we do. But Christmas Day is a work day here so any celebrations are only in the evening after work. Christmas in Ukraine was similar to most places in Europe until 1919. After the Communists took over, they banned Christmas completely and made December 25th a work and school day. But people wanted to celebrate so they created their own tradition. 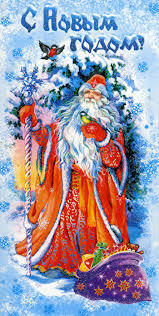 Instead of Santa Claus, they created “Дед Мороз” or “Grandfather Frost”. He’s a thin version of Santa Claus and he is accompanied by his helper, Снегу́рочка, or the “Snow Maiden” and they bring gifts to children on New Year’s Eve. The joyous news has come which never was before. Over a cave above a manger a bright star has lit the world, where Jesus was born from a virgin maiden, clad in raiment poor like a peasant baby, the shepherds with the lambs surrounded the child, and on knees they Him glorified. We beg you our King, we pray to you today, grant happiness and joy to this family. You know, our own kids could probably get away with singing that one in the classroom. The second version is a little meatier, even though they got the Christmas story down to two verses instead of four. The Joyous News has come which never was before. Long-awaited star of freedom lit the skies in October. (If you’re wondering about what happened on the date, the revolution took place in October.) Where formerly lived the kings and had the roots their nobles, there today with simple folks, Lenin’s glory hovers. The people of the Ukraine, both in and outside the Iron Curtain, were so carried away by these verses, they added one of their own. They sing it, but carefully refrain from putting it in the songbooks. It goes: “We beg you our Lord, we pray to you today. Grant us freedom, return glory to our Mother Ukraine.” I guess we all hope their prayer is answered. We do too! It is amazing to realize all that has happened here in Ukraine in the last 22 years. Christmas is again celebrated as the birth of Christ! But true freedom is still a struggle here. Pray that the message of Christmas might transform the nation and the message of Jesus might be supreme. I finished the class on Contemporary Issues in Theology in December and we are now waiting for papers to arrive so they can be graded also. It was a great class with lots of good, biblical discussions about each of these issues. I am also preparing for teaching the World History class in January followed by a class on the Theology of Prayer in March. Also, Katya is due at the end of January so we have a very busy few months ahead! In the fall, I decided to take a Russian class at the National Linguistics University in Kiev. I’ve been taking classes 4-5 hours a day plus doing another 3-4 hours homework each night. I can certainly see the improvements in my Russian but I have a long way to go! I’ll be continuing to take these classes in February until summer while I continue to try to teach my classes. It makes for a hectic schedule but I think it is really important for me to be taking Russian. Right now, Ukraine is in the process of a revolution (see previous updates or FaceBook postings). All is relatively calm here now but the government here continues to deny freedom of the press and the future of a free and independent Ukraine depends on what happens in the coming months. Please pray for Ukraine this year! Most of all, many still live in spiritual darkness without knowing the freedom the gospel can bring. Kiev Theological Seminary is training students and professors who are changing that, and Katya and I are glad we can be part of it!